Tip $35 and get handwritten lyrics to the song of your choice. Menni: Yay! Been so long :). erisa-rei: You are doing very well tonight. You're singing the best I've heard you, and you are really relaxed too. Menni: Some lovely songs before sleep, what more do we need. megdunnmusic: I hear Elton John in this one! Menni: And Elton is going on his farewell tour, so Lilly step in! Menni: This tour will take three years actually. megdunnmusic: Writing songs based around the sounds of newly discovered artists is great. Menni: Enchanting! Quite Tori Amos-ish. megdunnmusic: I'm with Menni on this one. megdunnmusic: Can I cover one of yours? erisa-rei: Hey, Eric-Kopp. You're gray head is handsome. Menni: This brings all sorts of images, mostly nature and art, gotta be a good thing. Sunset Cove: Love the sound of this sound! erisa-rei: You're getting more comfortable on camera. Sunset Cove: I remember you singing this backstage of My Fair Lady! Sunset Cove: Still love this song! Oldie but a goodie! Sunset Cove: Do you happen to know "Your Song" by Elton John? Great hearing "Love Song" .Thanks for the show! Handwritten lyrics to the song of your choice. Lilly Kopp, art-pop singer-songwriter from central IL, has been moved by music from a tender, young age. Her love of music began when she was a little girl taking ballet classes at the School of Nashville Ballet. Although a talented dancer, as the years progressed, Lilly's artistic soul became more drawn to the music than the movement. She felt the need to follow her heart, and pursue music instead. However, art was still at the forefront of her creativity, as she settled resolutely into the art-pop genre. 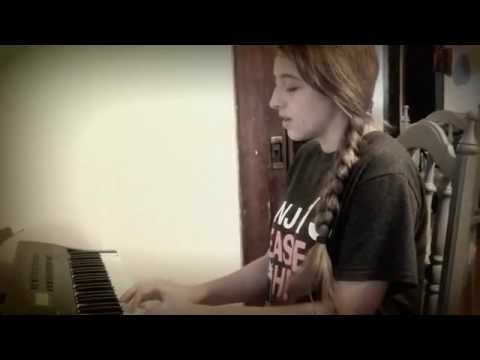 Self-taught, her piano stylings are a clever amalgam of Elton John, and the classical music that she heard daily during ballet classes. With her unique view of life, she stands out among peers, as having poignant lyrics, that some say are reminiscent of Joni Mitchell. An old soul, her mission is to create art in the form of music in order to inspire & ignite creativity. “My world of music is like a canvas that my emotions find their way to,” she says, “It expresses my feelings in hues more vibrant than paint could convey”. When listening to her music, you can certainly hear her paint her emotions on the canvas of her songs, her voice and her piano being her paintbrushes. Unique, delightful and thoughtful are all words that describe Lilly Kopp and her musical art.